The development of 14 new affordable homes was built by Whitefriars Housing, which is part of WM Housing Group, on a piece of land at Stretton Avenue and Dunsmore Avenue in Willenhall. 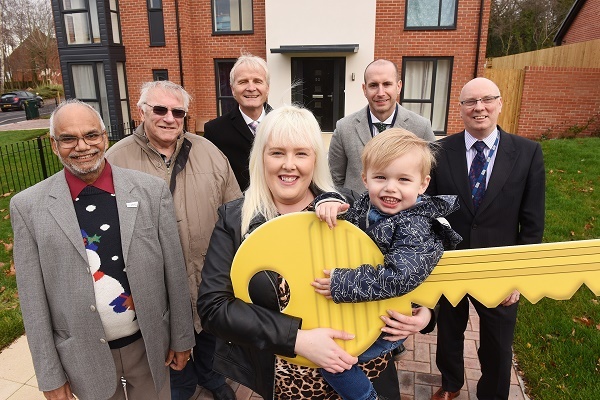 This is the first scheme in the city to be completed through a joint venture partnership between Whitefriars and Coventry City Council, which will see more than 230 homes built on land owned by the organisations. The new homes are a mix of three-bedroom and two-bedroom family homes as well as two-bedroom bungalows, a specific requirement of the project due to the lack of bungalows available in the area. All properties are now occupied on an affordable rent basis. Work also recently started at Tudor Grange, a new £9.5million, 72-home development in Canley, which is the second scheme in the joint venture. Whitefriars have built the much-needed homes in partnership with contractors, Jessup Brothers Ltd, with thanks to £400,000 of funding from Homes England. Kristy Weaver had been living in temporary accommodation for six months before moving into her new two-bedroom home with her two-year old son, Leon. Kristy said: “I love it here, I’m over the moon. The house is really nice and spacious, very light with really nice little finishing touches. Nick Byrne, Executive Director of Development at WM Housing, said: “We are delighted to complete this development and provide Kristy and other residents with a new home in time for Christmas. “We are now really starting to see the fruits of the joint venture we have with the council with this site completed and another large site starting within the space of weeks.